There is a lot of information about composers on Wikipedia, so there's little point in duplicating it here. Each composer's entry will probably contain a link to Wikipedia, or some other external source. 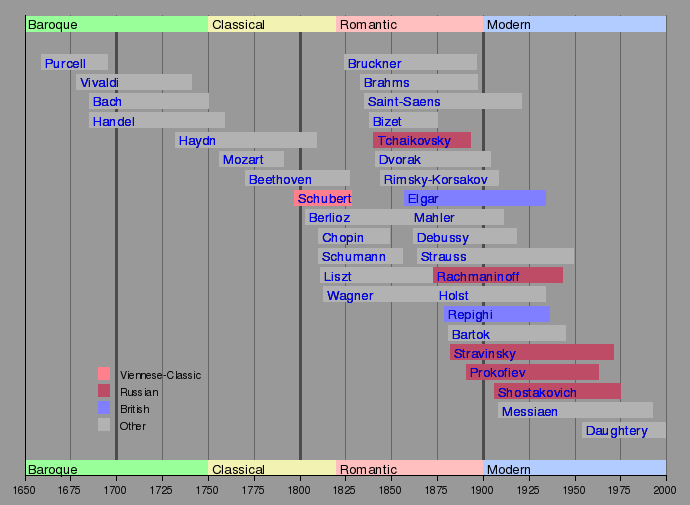 Some composers may be less well known. Consider making an entry in Wikipedia and linking from here. So what can we write here? Here we may expect to see some more anecdotal information about composers, or opinions about a composer's music. Where sources of anecdotes can be found, they should be cited. If anecdotes are found to be untrue, or "urban myths", they should be removed. We could also use a section on opinions, to comment on a composer's overall output, or a section on pieces worth hearing. Even a section on pieces to avoid could be useful. Obviously different writers may put a piece in different categories. Let's see what happens!